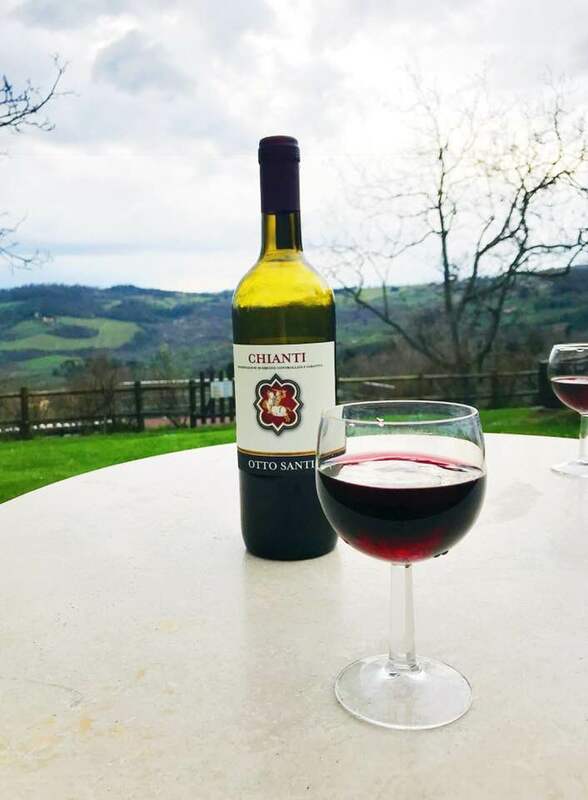 Chelsea and Kyle's trip to Tuscany, Italy. Our stay began at Poggio Al Sole, an authentic bed & breakfast, which beautifully translates to a hill in the sun. 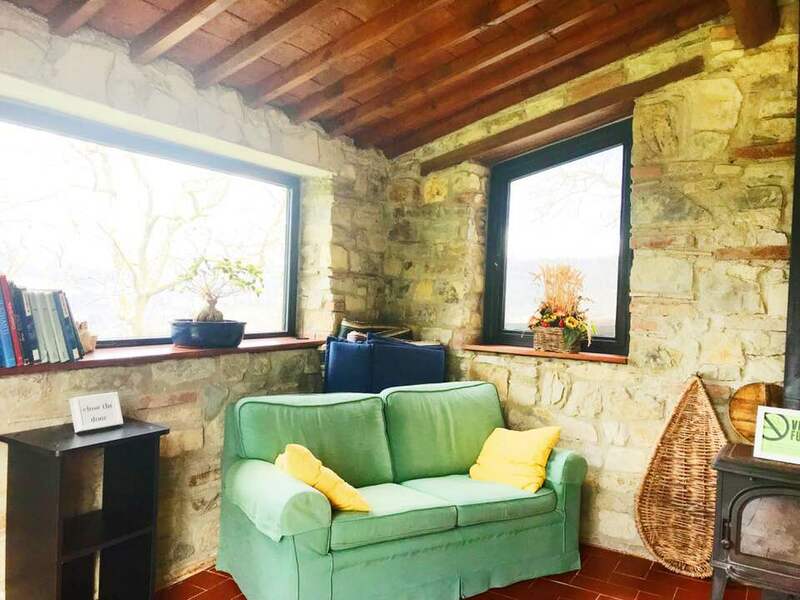 Poggio Al Sole is tucked away in the Tuscan hills, eight miles from the nearest town. The couple that runs the B&B are farmers and distribute their own organically grown saffron, olive oil, and wine which made the dreamy idea of this Tuscan bed & breakfast that much more whimsical. We arrived, parked, and knocked on what we presumed to be the front door; after quite a long time of knocking and some nervous hope-we-didn't-get-duped looks to one another, a kind-faced, older woman answered the door with a huge smile and a soft and sweet "Bonjourno!" She led us to our accommodation for the weekend using a few of the English words she knew, which included "my husband will be here soon, he can speak to you more" and left us in a small, simply decorated bedroom. One of the first things that caught my attention was the simplistic decor. There were fresh flowers on the dresser and the bed was clean and freshly-made. That was all that was needed. Here, artificial decorations aren't necessary to make a place feel homey. Instead, they have large windows in all the rooms; open them and there is the greatest decoration of all: rolling hills lined with olive trees and the giant, majestic sun sitting royally in a clear blue sky. Nature is the most organic decoration one can get, and the Tuscans take full advantage of that. 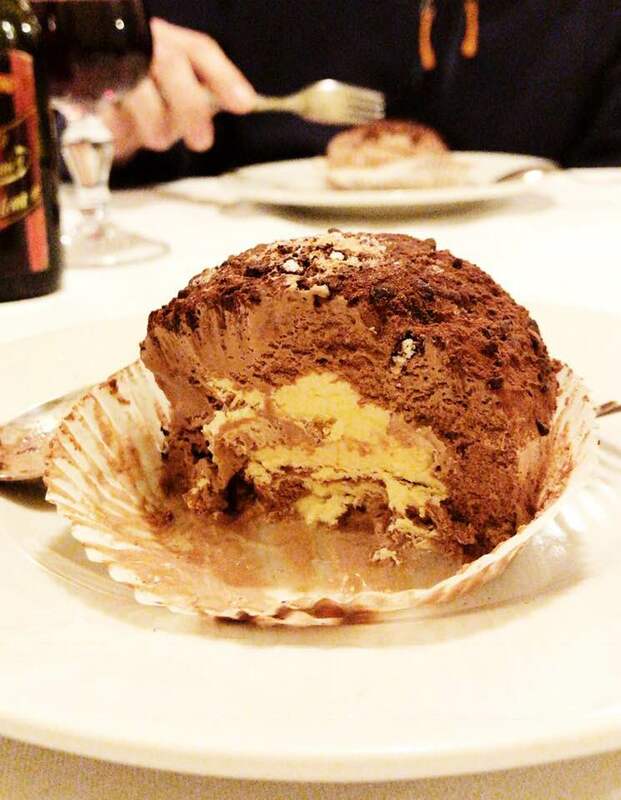 Once her husband arrived, he explained to us where the closest (and only) restaurant within eight miles is located and how to get into the nearby, small village of Fiesole. We bought a bottle of homemade wine from him and sat outside in the tiny courtyard, talking, and watching the sun fade into the hills until dinner time. The next morning, we were woken up by early spring sunlight dancing sleepily through our blinds. We made our way to the main house by walking through the courtyard outside of our room. Surrounding us were birds cheerfully singing their mornings songs and a magical mist that was lingering on the rolling hills. We entered the home and found ourselves seated at a long, wooden breakfast table among other weekend guests. 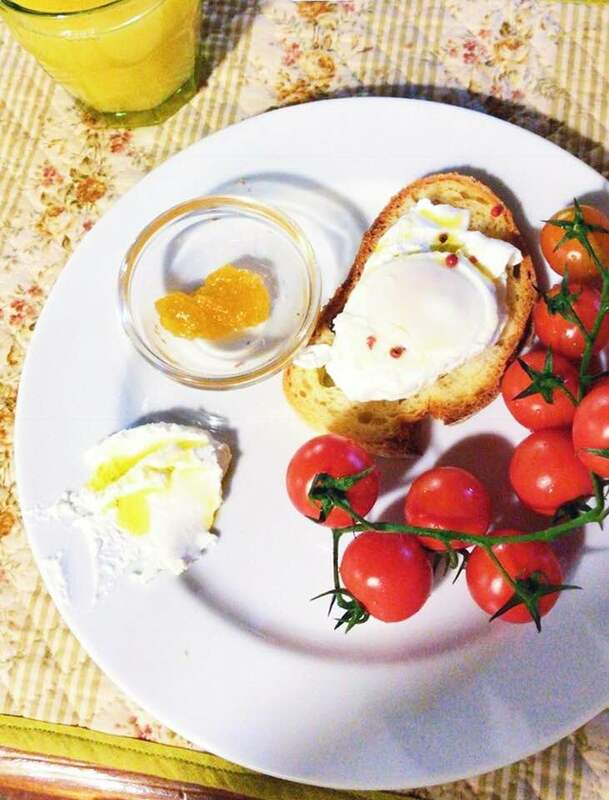 Laid out for us was homemade saffron cake, farm fresh honey, homemade jam, fresh fried eggs on homemade bread, local ricotta cheese, and juicy, red tomatoes. The sweet women who greeted us the day before prepared the entire spread that morning. There was a fire blazing in the fireplace, candles lit along the center of the table, and soft, jazz music playing in the background. Everyone was sipping their morning espresso from bowl-sized mugs and enjoying a breakfast cooked so obviously with love, passion, and homegrown ingredients. It was possibly the coziest and most delicious breakfast experience I have ever had. After our incredible breakfast, we got ready for the day and found ourselves back at the restaurant from the night before for a quick cappuccino while waiting for a bus to take us into the small town of Fiesole. We were signed up for a Tuscan cooking experience later that afternoon and we knew that we would be having a few glasses of wine intermixed. We decided it would be smart to take advantage of the local public transportation system, which is actually one bus every four hours. We sipped our foamy milk and espresso and kept an eye on the bus stop. The bus came right on time; although after living in Prague and experiencing numerous other large European cities, when I think of a public transport bus, I think of the real deal: a large, crowded bus with stops every few minutes. However, Tuscan public transport is quite different. Think a glorified, empty van that stopped once in the twenty-five minutes we were on it. 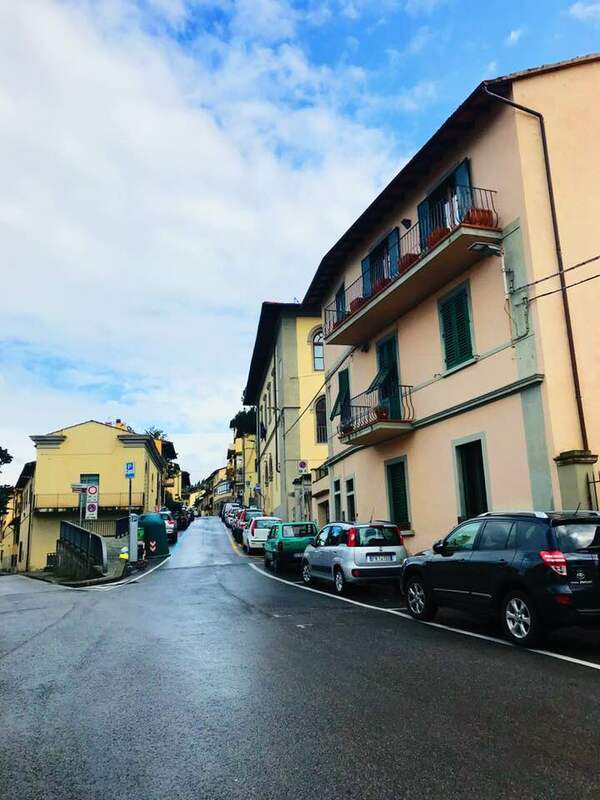 We had no idea how to buy tickets, and after nearly a half hour of twists and turns and somehow squeezing through multiple cars parked on tiny side streets, our driver dropped us off in the center of Fiesole. Because of the ticket confusion, before exiting we kindly asked to purchase a ticket, but he waved us off, closed his doors, and drove away. Classic. We walked around the tiny town and decided to duck into a pizza restaurant just in the nick of time before the sky opened up into a torrential downpour. We shared a fried eggplant pizza and had a nice glass of wine while nature did her thing. After the rain stopped, the sky turned into the most beautiful shade of blue and the sun was out to play. So we explored. 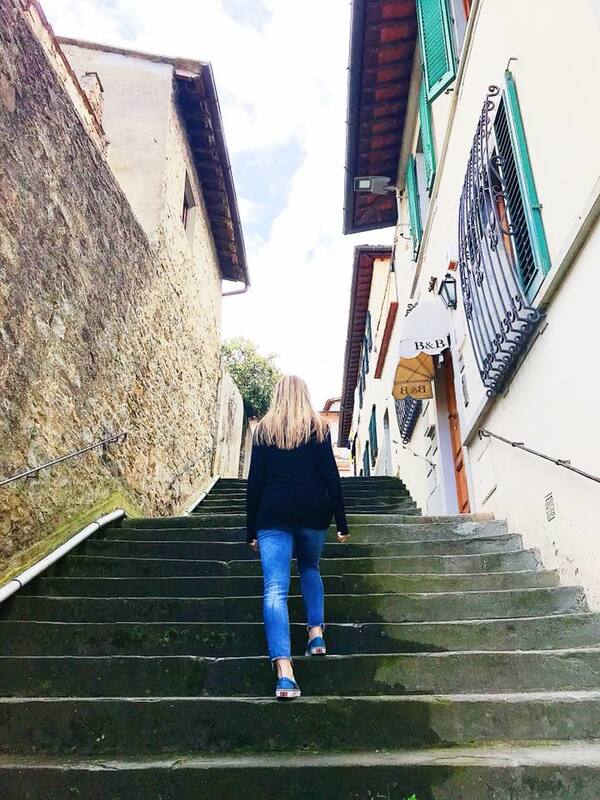 When exploring in a tiny Tuscan village, it's important to note that the beauty is in the tall staircases, the colorful buildings, the blooming flowers on the side of the road, and the open windows of the Italians who are embracing the just-after-it-rained fresh air. There are no grand monuments or ancient great halls in these places, just simple fixtures that make it the beloved Tuscany. The next morning, Easter Sunday, we enjoyed another beautiful breakfast spread made by our talented host. Afterward, we made our way into the booming, packed city of Florence. We made it to the center of the city, where the Duomo is located and wandered in as the Easter service was beginning. Boy, were we in for an experience. There were tourists lining the church, taking pictures, and standing on chairs to get the best view. I grew up Catholic, so I had a hunch of what this mass would consist of - however, I was hilariously wrong. This was no traditional Easter mass. After the procession down the aisle of the various priests, the main priest stood up with his incense, said his words in Italian, and then released a fake, fire lit dove tied to a string. The dove flew down the aisle, out of the church, and busted into various, ornately decorated boxes piled high outside. The boxes then lit up and started exploding into fireworks. This firework show lasted a solid ten minutes. I wondered if this was somehow reaped in tradition, or if this was a show for the various tourists. Either way, it was an Easter celebration I'll never forget. We eventually made our way back to our bed & breakfast, got ready for dinner, and for our last night, we ventured back to our newly beloved La Casa Prosciutto Trattoria. During our Tuscan cooking class the day before, we asked our class hosts what was up with no one eating pasta at dinner. We were surprised to learn that very rarely do Italians eat pasta for dinner - instead they normally enjoy a pasta dish for lunch and then a protein and various side dishes for dinner. So that night, in the spirit of eating like true Tuscans, we ordered the Florentine steak with a side of spinach and white beans. The steak was cooked to perfection, sitting on the rarer side, just the way we like it. The spinach was garlicky and delicious, and as our kind, hardworking waiter brought out the white beans, he said, "olive oil, salt, and pepper on these", so we did just that and they were incredible. That night, as we sat there and drank our wine and ate our local steak, I looked around the restaurant. Here is what I saw: two couples on a double-date, juggling their newborn babies, laughing, feeding the little ones, and enjoying a meal together. A mom and dad with five children; no phones at the table, just pure conversation, and a shared, nourishing meal. A young couple, slowly eating a plate of prosciutto while whispering to each other and clinking their wine glasses together. All over the restaurant were local families who came out for a nice, Easter dinner. There were dishes being passed all around each table, as all of the meals were served family-style. These people were in the restaurant until closing time, savoring each course of their meal and relishing in pleasant conversation. This art of enjoyment, of slow living, is a known livelihood in Italy. It's what people do. Seeing these various families and friends living for conversation and laughter was a genuinely beautiful sight to behold. So often in our western culture, we engage more with our screens than the people around us; we scarf down our meals, not taking time to think of how it was prepared or where it came from; and we tend to make complaints about our meal or see the negative in our dining experiences. There was no complaining in that room, not to the waiter or to each other. Only laughter, heavy-handed pours of wine, conversation, and the reveling in an authentically cooked meal. I returned to our B&B that night with so much peace in my heart and so much appreciation to these strangers. I hope the next time you are planning a trip to Europe, you consider Tuscany. Don't let the lack of "things to do" detract you from this incredible region. Tasting wine, laughing with a loved one, and eating copious amounts of pasta should be enough anyway, right? Visit this magical region to appreciate morning mist and the juiciness of a fresh tomato. Visit Tuscany to observe everyday people truly savoring life, and then take that practice home and implement it in your everyday life. If you've been to Tuscany or you're planning a trip anytime in the near future - leave me a comment! I would love to hear about your experience or help you plan the perfect trip to this magical part of the world.